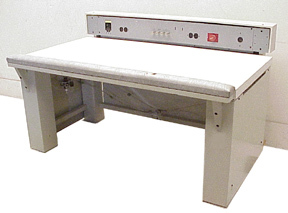 In addition to this item, Capovani Brothers Inc stocks a wide range of used optical tables and vibration isolation tables. Typical manufacturers include Barry Controls, Ealing Electro-Optics, Kinetic Systems, Newport, and Technical Manufacturing Corp.(TMC). Other Information Padded arm rests. (2) duplex outlets w/15 A breaker and emergency shut off switch. Quick disconnects for air, N2 and vacuum.